Chris Hadfield has spent decades training as an astronaut and has logged nearly 4000 hours in space. During this time he has broken into a Space Station with a Swiss army knife, disposed of a live snake while piloting a plane, and been temporarily blinded while clinging to the exterior of an orbiting spacecraft. 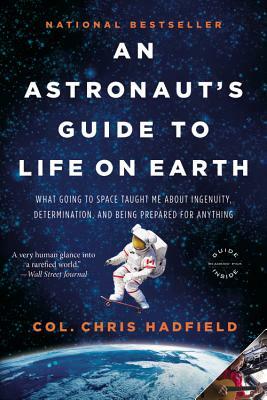 In his bestselling An Astronaut's Guide to Life on Earth, Hadfield takes readers deep into his years of training and space exploration to show how to make the impossible possible. Through eye-opening, entertaining stories, his vivid and refreshing insights will teach you how to think like an astronaut, and will change, completely, the way you view life on Earth-especially your own. Chris Hadfield is one of the most seasoned and accomplished astronauts in the world. In May 2013, Hadfield returned to Earth after serving as Commander of the International Space Station, where he and his crew lived for five months (his third mission). The top graduate of the U.S. Air Force Test Pilot School in 1988 and U.S. Navy Test Pilot of the Year in 1991, Hadfield was selected to be an astronaut in 1992.